JCGs serve the Java, SOA, Agile and Telecom communities with daily news written by domain experts, articles, tutorials, reviews, announcements, code snippets and open source projects. Apache ActiveMQ is an open source message broker written in Java together with a full Java Message Service (JMS) client. It provides “Enterprise Features” which in this case means fostering the communication from more than one client or server. Supported clients include Java via JMS 1.1 as well as several other “cross language” clients. The communication is managed with features such as computer clustering and ability to use any database as a JMS persistence provider besides virtual memory, cache, and journal persistency. The ActiveMQ project was originally created by its founders from LogicBlaze in 2004, as an open source message broker, hosted by CodeHaus. The code and ActiveMQ trademark were donated to the Apache Software Foundation in 2007, where the founders continued to develop the codebase with the extended Apache community. ActiveMQ employs several modes for high availability, including both file-system and database row-level locking mechanisms, sharing of the persistence store via a shared filesystem, or true replication using Apache ZooKeeper. A robust horizontal scaling mechanism called a Network of Brokers, is also supported out of the box. In the enterprise, ActiveMQ is celebrated for its flexibility in configuration, and its support for a relatively large number of transport protocols, including OpenWire, STOMP, MQTT, AMQP, REST, and WebSockets. straightforward tutorials, you will be able to get your own projects up and running in minimum time. 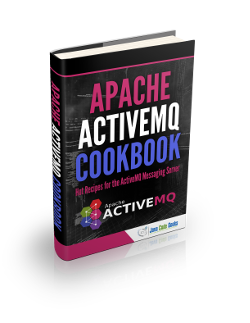 Comments Off on Apache ActiveMQ Cookbook Views Tweet it!